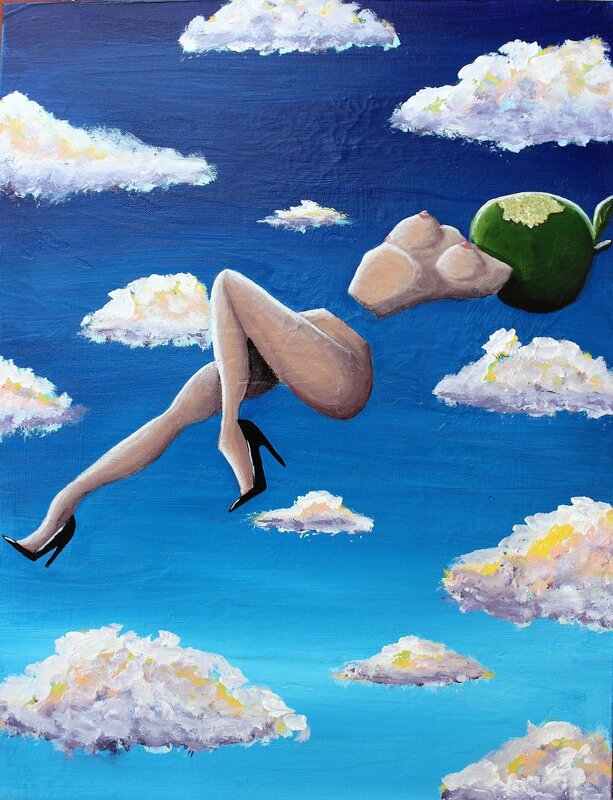 The Unforgiven Sins of Eve’s Apple is an expansion on a painting called The Duality of Temptation. I decided to create the series after the public spectacle around the appointment of Brett Kavanaugh as Supreme Justice despite the sexual harassment allegations against him. It was horrific watching how Dr. Christine Blasey Ford, a reputable, educated women, was ridiculed for being brave enough to come forward to tell her story. There is a piece in the series called Whore or Harlot which addresses how negatively women are treated when they make sexual assault allegations against a public figure even if these women conform to society’s expectations of a “good woman”. I wanted to create a series that depicts how I feel women are viewed in Western society. At first, the series may seem overtly sexual, which is intentional. There are three “women” whom I like to call Eve’s Apples, depicted throughout the series. They each have a large apple with a bite in it instead of a normal head and their bodies consist of what I like to call “tasty bits” (i.e. breasts, long slender legs, FM pumps etc). 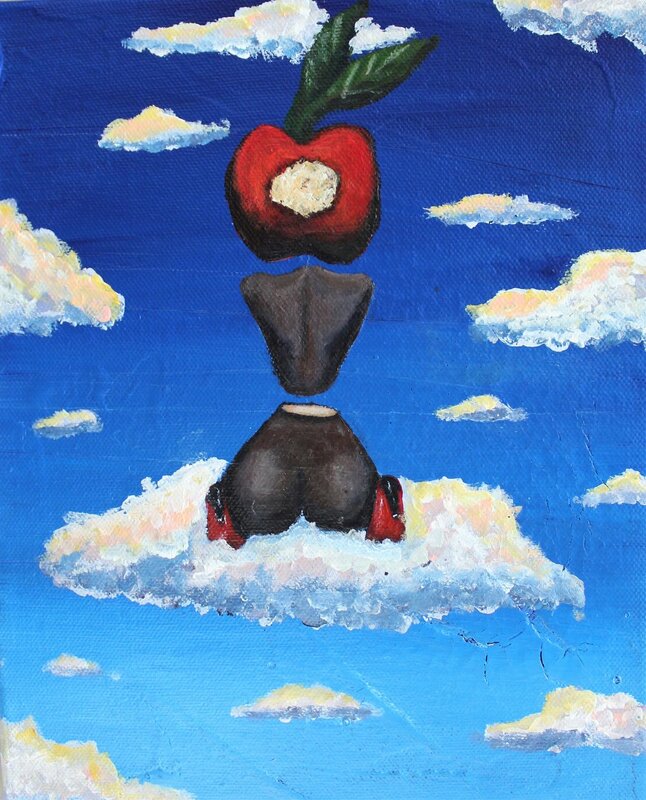 The fact that they have apples instead of heads represents the fact that society doesn’t really want women who think for themselves and the apple itself is a biblical reference to Eve biting into the Forbidden Fruit and committing the very first sin – a sin that has since been used as justification for the countless crimes committed against women even to this very day. They don’t have arms because arms represent, at least superficially, the ability to be self-sufficient. The lack of arms prevents Eve’s Apples from doing anything for themselves, shaping their own future or creating the change that is necessary to make their lives easier. 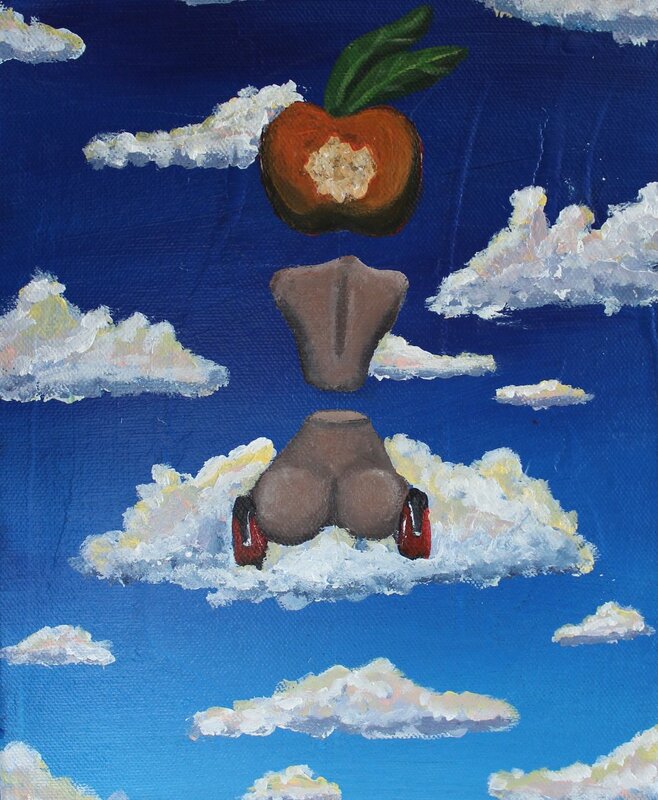 Eve’s Apples are oversexed, provocative, but completely thoughtless and helpless. They represent the idealized definition of womanhood that I feel is being perpetuated by society and the media. I would be remiss if I did not give credit to Salvador Dali, Rene Magritte and Frida Kahlo, as their work greatly influenced this series. I took elements of their surrealism style and tried to make them my own while trying to get my point across.